Autoantibodies can be demonstrated in many of these syndromes. These include autoantibodies against NMDAR, LgI1, CASPR2, GAD, GABA(b)R, AMPAR, GlyR, DPPX, D2R, MOG. The GENERATE network is committed to educating the medical and patient communities about syndromes with known antibodies as well as about “seronegative” syndromes, while driving the search for new target antigens. The goal of this initiative is to ensure the best-in-class care of patients suffering from this rare disease by promoting autoimmune encephalitis-related education, research and therapy. By bundling the knowledge and experience of all stakeholders, we can succeed in getting those affected rapid access to the necessary treatments and enable them to liaise with specialist centers. The GENERATE homepage provides information about these diseases and makes it easy to find the appropriate specialized centers. It additionally posts evidence and references on pathophysiology, diagnostics and therapy. 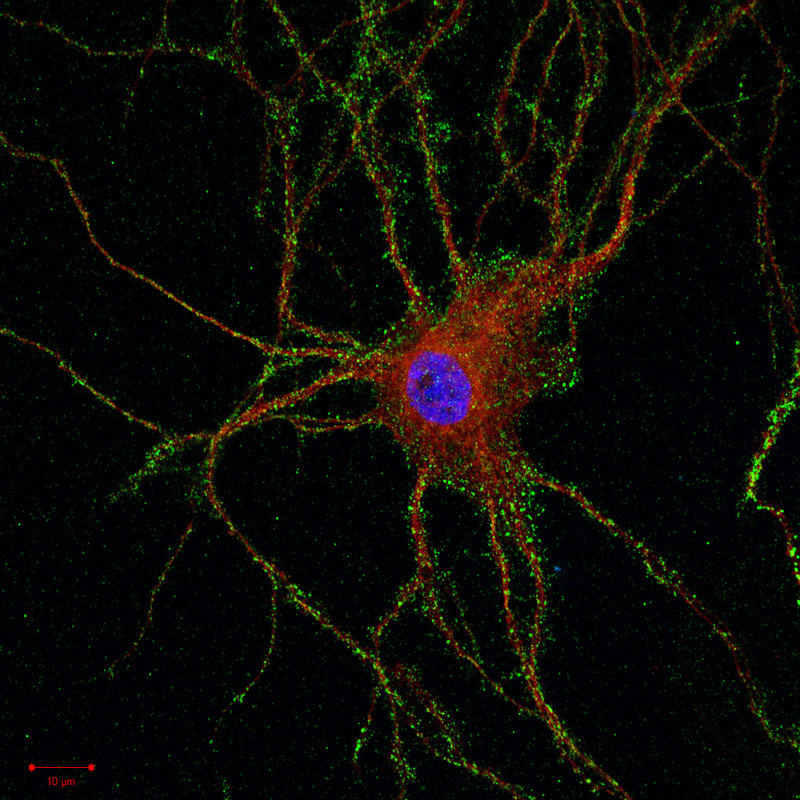 Anti-NMDAR antibodies (green) on a hippocampal neuron (red). DAPI-stained nucleus (blue).